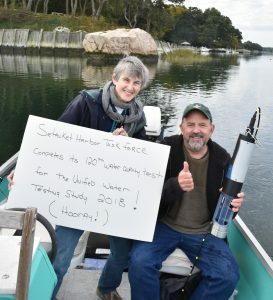 As the sun rose on October 31st, illuminating the calm surface of the Sound, a network of monitoring groups conducted the final dawn monitoring run of the Unified Water Study (UWS) for 2018. Groups interested in participating in this groundbreaking water quality study grew again this year. Twenty groups monitored the waters in 36 bays and harbors (embayments) – up from 12 groups monitoring 24 embayments in 2017. In total, there were over 400 dawn sampling runs where more than 4,500 dissolved oxygen, chlorophyll a, turbidity, temperature, salinity, and macrophytes (aka seaweed and seagrass) samples were collected! 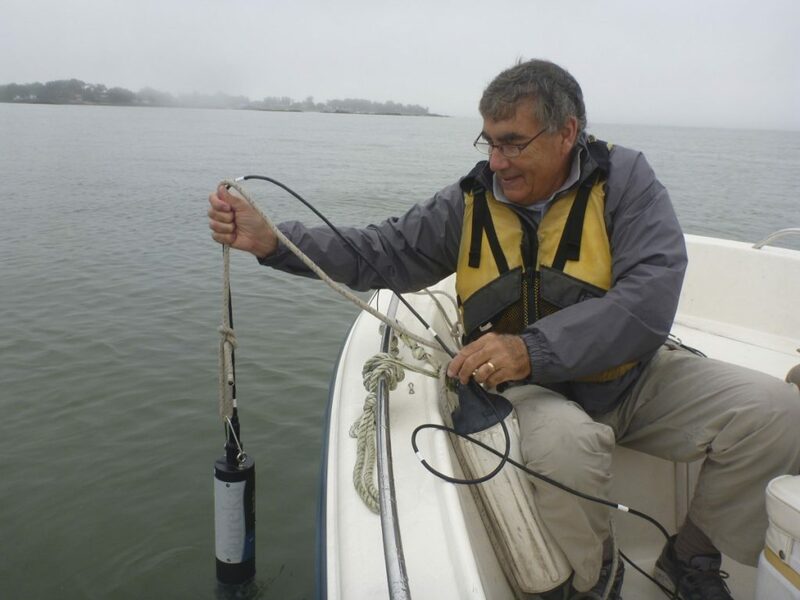 This study was started to answer the question, what are the impacts of nutrients on the shallow-water bays and harbors that encircle the Long Island Sound? The goal is to identify the embayments that are suffering from this pervasive pollutant and drive action to reduce it where needed. Locations with high nitrogen levels are susceptible to algae blooms and low oxygen conditions which can cause fish die offs. Our preliminary analyses show hypoxia (very low oxygen) in many of these waterways. 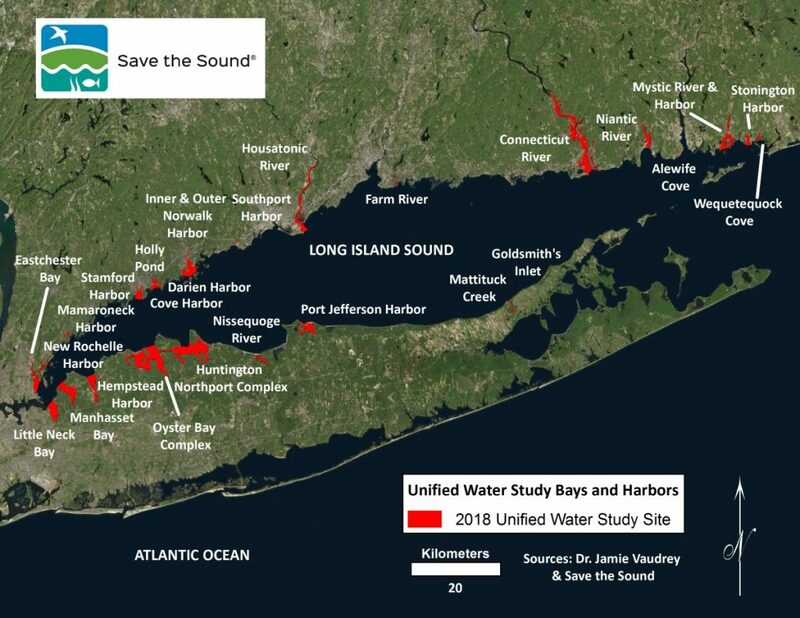 Save the Sound would like to thank all of the UWS monitoring groups. It is a pleasure and honor to work with such a dedicated aggregate of people. The collective experiences of this group greatly strengthen this monitoring effort and the diverse set of personalities makes the collaboration a lot of fun! We all share deep-seated interests in healthy Long Island Sound waters for people to enjoy, where plants and animals thrive. Put simply, this study would not be possible without their commitment. A thank you is also in order for the agencies, such as the Long Island Sound Study, CTDEEP, NYSDEC, IEC and NYCDEP that have contributed in various ways to the study and have committed to use these data for management purposes. At Save the Sound we have already begun our work preparing for the 2019 season. We anticipate a further expansion in the number of waterways and groups in the study. We will also be rolling out additional water quality parameters in select embayments. This second tier of monitoring will include continuous dissolved oxygen, nutrients, and video surveys of the bottoms of embayments to quantify the amount of seaweed present. These are very technical procedures that will greatly enhance the data pool and understanding of Long Island Sound bays and harbors. Stay tuned for the publication of the data from 2017 and 2018 in the coming weeks. A robust presentation of the findings will be included in the 2020 Long Island Sound Report Card. Clean Up Sound & Harbors, Inc.